Customers are a rich source of innovation insight, and the ultimate authority on what innovation is useful. So it’d be good to understand what types of insights they provide. OK, not just good. Vital. While the incorporation of customers in the innovation process is…honestly….still nascent, it will ultimately be the primary basis of innovation insight. It just will take some time. Based on research, the four types of insight are different, and vary in the ease of eliciting and what they address. Let’s take a look. “Jobs to Be Done”. What is that? It’s why someone purchases a product. A classic formulation of this is by Theodore Levitt: “People don’t want to buy a quarter-inch drill. They want a quarter-inch hole.” That starts to hit on the notion of the job. But it’s more than the direct outcome one is looking for from a product. 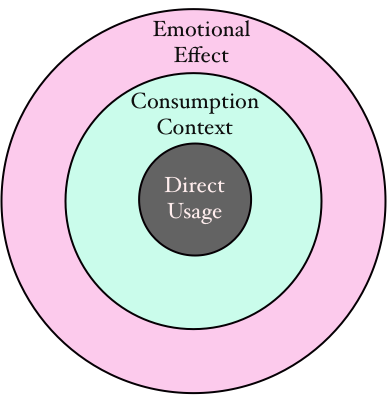 As the diagram to the right shows, it also includes the consumption context and the emotional effect. Context paints the broader picture of the job to be done. Emotional effect broadens the discussion to include the experience of using the product. Clayton Christensen provides a wonderful example of this, talking about the job that customers were hiring…a milkshake…for. Yes, a milkshake. There was a lot more behind that purchase than its direct usage as a cold, sweet drink. 40% of shakes were being bought in the early morning. The consumption context was people commuting in the morning, drinking a shake in lieu of breakfast. The shake’s emotional effect was stave off boredom and satisfy a general hunger at the start of the day. Of all the innovation insights available, the jobs-to-be-done is the most plentiful. The challenge with this feedback is that it’s buried inside people’s heads, and it must be elicited from them. Practitioners such as ReWired Group and Strategyn get at the jobs to be done through deep dive interviews with customers. Say you had a product concept, and you wanted to get a read on its applicability to people’s jobs-to-be-done. More broadly, you’d love to know what works, what doesn’t and what else is needed to make a splash in the general market. Will any old customers do? Turns out…no. What you’re looking for are emergent customers. 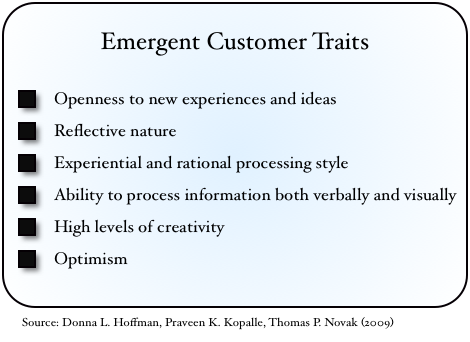 What are these traits that define a customer’s emergent nature? The researchers created two separate field tests of example products – home delivery and oral care – to validate their hypotheses about emergent customers vs. other types. Their tests confirmed the ability of these customers to better refine a concept for mainstream acceptance than other types of customers. Lead users are those customers who alter a company’s product to fit an emerging job they need fulfilled. MIT professor and economist Eric von Hippel popularized the existence of these users in his book Democratizing Innovation. Why are they so important? Because they experience new needs for products before the general market does. Find these users, and you gain an early read on what will be important more broadly in the months and years ahead. Lead users not only experience these emerging market trends earlier, they are motivated to take action on them. The needs they experience and the product adaptations they make are quite valuable. Find these users, and learn where your market’s going. 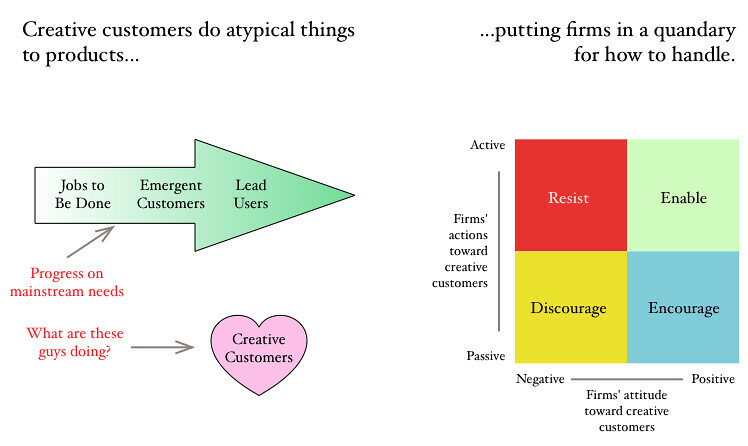 Creative customers are the uninvited dinner guests in the path toward mainstream innovation. While the jobs to be done, emergent customers and lead users provide incredibly valuable insight to make stronger, more successful innovations, creative customers…um…don’t really? The phenomenon of creative customers was researched by academics Pierre R. Berthon, Leyland F. Pitt, Ian McCarthy and Steven M. Kates in their paper, When customers get clever: Managerial approaches to dealing with creative consumers. Examples of creative customer innovations include the guy who used FedEx boxes to create furniture. Admittedly, not what those boxes were made for. Or the car fueled by Mentos candy and Diet Coke. They’re creative, but certainly not of the lead user class of innovations. Yet, each in their own way, point to impressions people have about the products (the incredible stiffness of FedEx boxes makes them a furniture material, the fizz of Diet Coke and Mentos is a fuel source). Companies gain diverse thinking about their products, but such innovations do pose challenges around intellectual property, branding and liability. The researchers categorize the possible firm responses to such innovations in a 2×2 grid (shown above), based on attitudes and actions toward creative customers. But here’s the thing: creative customers aren’t going away, and their legions will increase over time. They make interesting dinner companions at the innovation banquet. 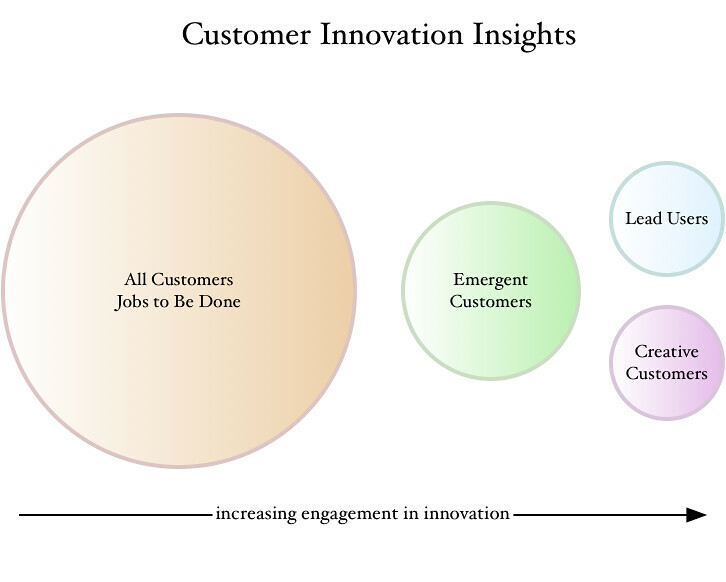 The four innovation insights described here form a broad and powerful set on inputs from customers. While the broad involvement of customers in innovation is still limited and nascent, these different types of insight provide a path for future activity by firms.